A HIGHWAY LAID WITH WATER. An account of the Grand Junction Canal, 1792 - 1928, with a postscript. Ian Petticrew and Wendy Austin. A. Harvey-Taylor (Aylesbury) narrow boats at Tring Flour Mills on the Wendover Arm. The Bridgewater Canal was Britain’s first true canal. Opened in 1761, it demonstrated the feasibility of using a man-made waterway to move heavy loads comparatively quickly over distance. A transport revolution then followed during which the many canals built to exploit this new load moving ability were to become both cause and effect of the rapid industrialisation of the Midlands and the north of England. Improved transport communications made centralised industrial manufacture viable and was thus an important factor in bringing about the transition from cottage industry to the factory system. Completion of the Oxford Canal in 1790 provided a link between our growing canal network and London. However, the route was unsatisfactory; not only was it over-long, but the section that relied on the River Thames below Oxford was difficult to navigate. 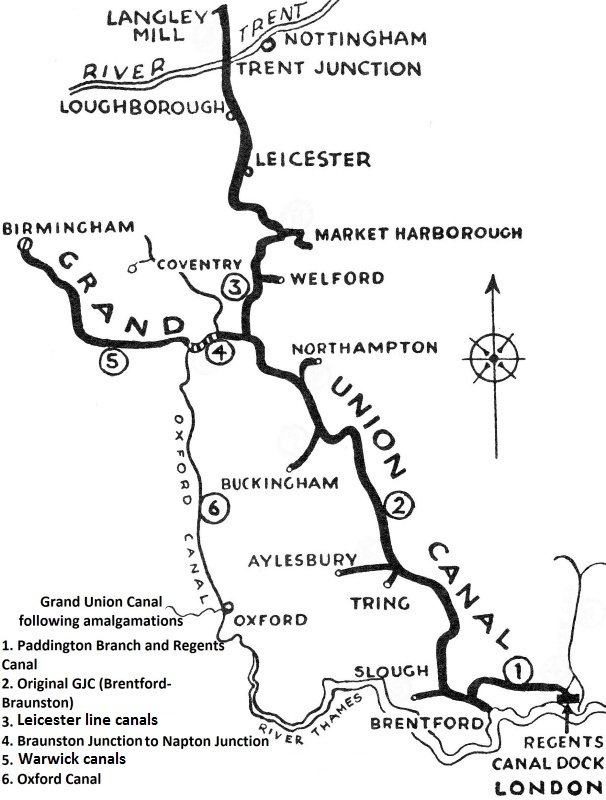 The need for a more direct and reliable waterway to link the Capital with the Midlands and the north of England led to the construction of the Grand Junction Canal. At its northern end, the Canal forms a junction with the Oxford Canal at Braunston in Northamptonshire (just to the right of point ‘4’ on the sketch map). The waterway then follows a south-easterly course via Wolverton, Leighton, Tring and Uxbridge to reach the River Thames at Brentford, with an important branch from Hayes to Paddington — this was later extended by the Regent’s Canal to make a further connection to the Thames at Limehouse (point ‘1’ on the sketch map. absorbed into this larger network (the branch to Buckingham had been abandoned). Construction commenced in 1793. By 1800, the Canal was substantially complete, a short gap remaining between Stoke Bruerne and Blisworth where civil engineering problems with the long Blisworth Tunnel delayed final completion until 1805. For some years thereafter the Canal was very profitable, but from the 1840s onwards it fell into commercial decline as the mainline railways ― principally the London & Birmingham Railway ― gradually captured its long distance trade. Throughout the canal industry this second transport revolution forced companies to reduce their tariffs to barely economic levels to retain what business they could in the face of this new and voracious competition ― many went to the wall. 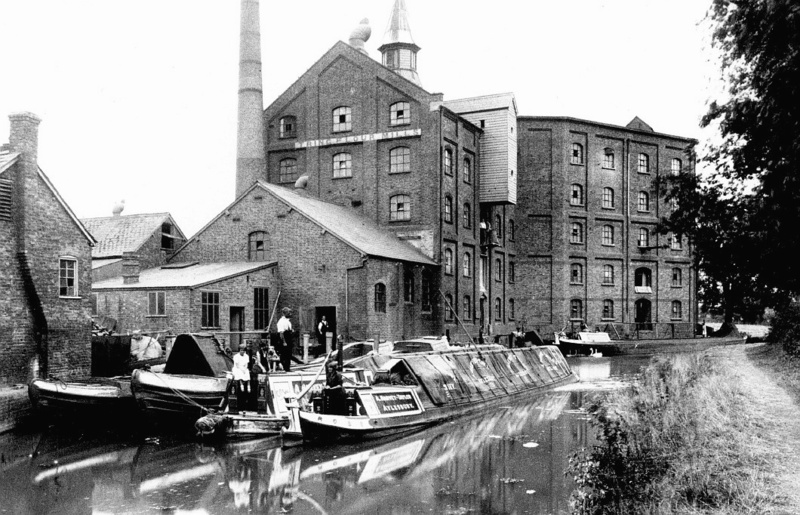 In 1894, the Grand Junction Canal Company bought two of the Leicestershire canals, their owners being on the verge of insolvency, thereby extending its domain to Leicester. 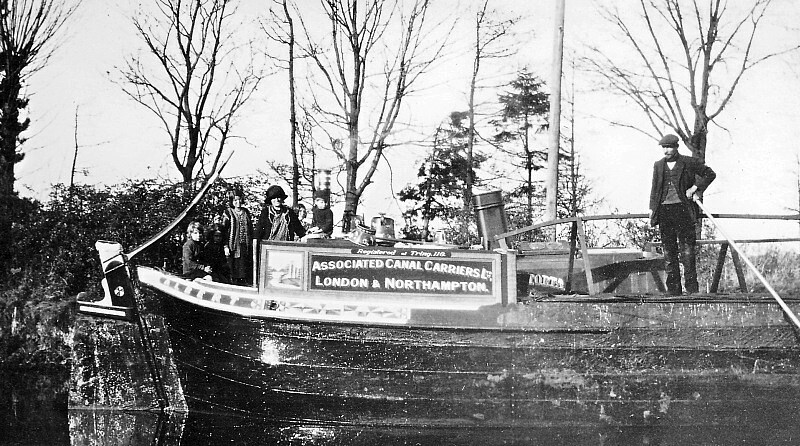 Then, in 1929, the Company amalgamated with the Regent’s and Warwick canals to form the Grand Union Canal Company and bring under single ownership the waterway from Brentford and Limehouse on the Thames, to Birmingham. Further canal purchases in 1932 extended the network from Leicester to the River Trent and onwards to the Nottinghamshire/Derbyshire border. But despite a greater mileage of canals being brought under unified control and heavy investment in improvements, rail and increasingly road continued to dominate the transport industry. A growing shortage of boatmen prepared to accept the rigors of canal life added to the Company’s difficulties. By the mid-1950s only the section of the Canal below Uxbridge remained commercially viable. 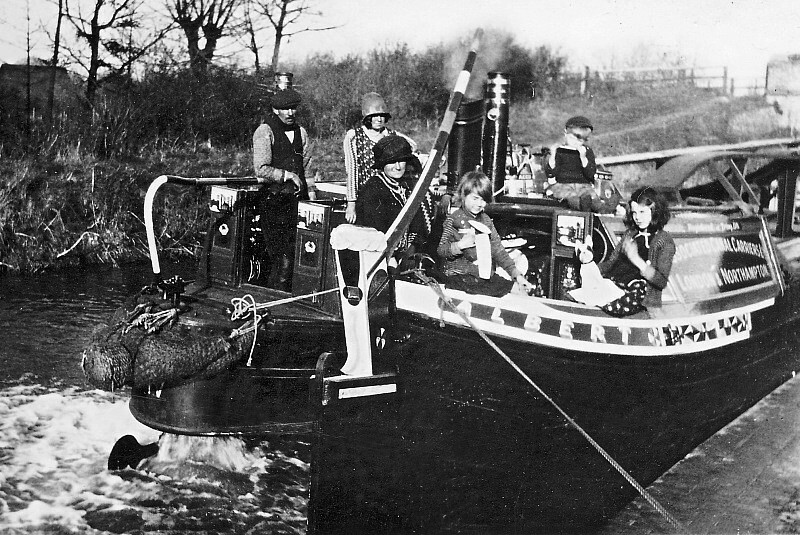 A decade later, trade had diminished to negligible proportions, but by then canal carrying was being superseded by leisure cruising, a fact recognised in the 1968 Transport Act, which gave British Waterways a remit to develop our canals for leisure use. Today the Grand Union Canal (as it now is) carries more leisure traffic during the summer season than its predecessor did commercial traffic during its heyday as a major arterial highway. The following account deals with these events in more detail ― we hope you find it interesting. FOREWORD . . . .
ON THE WENDOVER ARM, TRING, c.1930s. 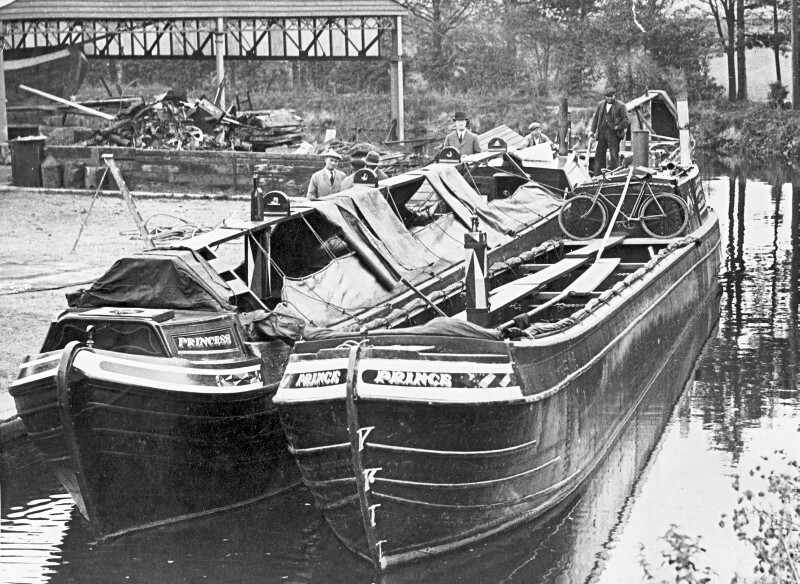 Motor boat Prince and butty Princess, owned by Ovaltine of Kings Langley. Princess of wood by Bushell Brothers at their Tring Dockyard. The pair are pictured here at Gamnel Bridge on the Wendover Arm, Tring. Mr. and Mrs. Ward, daughter Phoebe and her children from Startops End at the Tring Flour Mills on the Wendover Arm. They had delivered a cargo of Manitoba wheat. The IRIS was owned by A. Harvey-Taylor of Aylesbury and registered at Tring.